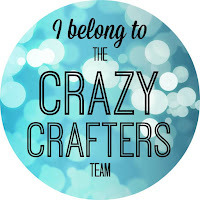 The Crafty Thinker: Stephanie Fischer - Independent Stampin' Up Demonstrator: Holiday Catalogue 2015 - Sneak Peak! I know, we don't have snow at Christmas in Austalia .... we still like our traditional (Northern Hemisphere) Christmas images though, to get us in the spirit! I set out to create depth by placing dark colours in the foreground fading to lighter in the background. By using a monochromatic colour scheme, I was aiming to evoke a silent, late night sleigh ride. The only colour comes from the cosy, warm houses on the distant hill. Glitter ribbon (it will also be available in gold) - NB I used two pieces side by side on this card. 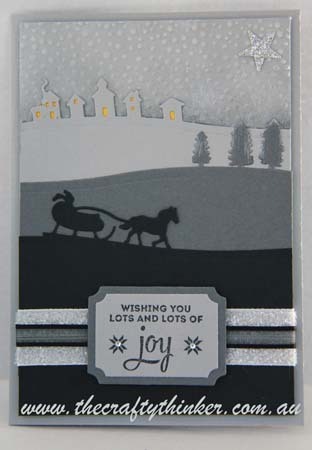 I also used the Lots of Joy stamp set, the star from the Itty Bitty Accents punch set, Tags & Labels Framelits and some silver glimmer paper - all from the Annual Catalogue. I've added a little of black ribbon from my stash and a couple of tiny crystals. You can order an item by clicking on the picture below. I love the card! Thanks for sharing.